Scaffold Resource has been dedicated to providing scaffolding and shoring systems to construction companies across the D.C. area since 1996. Our supplies have been integral in the building and renovation of several notable buildings across Washington, D.C., Maryland, and Virginia, including the Chesapeake Bay Bridge and the U.S. Capitol Dome. If you need scaffolding services for your project, here is a look at what to expect. 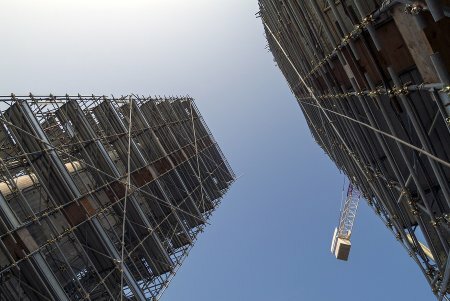 Every construction project is unique, so we start by working with you to ensure that you get the right scaffolding for your needs. We can help you select the type of scaffolding that is appropriate for your job, including system, frame, and tube and clamp scaffolding, as well as the right size, height, and amount for your job. We will also help you ensure that you have the appropriate safety equipment to protect your employees for the duration of your project. Our skilled workers can install and dismantle your scaffolding on your project site quickly and efficiently. We are adept at handling tight turnaround times and ensure fast, safe erection and dismantling of scaffolding, even in difficult work conditions. Using our erection and dismantling services helps to keep your project on time and on budget , while giving you the confidence that your scaffolding has been installed safely for your employees. When your project involves difficult conditions, such as extreme heights or the need for high-capacity work platforms, we can engineer a scaffolding system that safely meets these challenges. Our experience working with complex projects demonstrates our commitment to custom scaffolding design to let you meet your project deadlines under even the most challenging conditions. 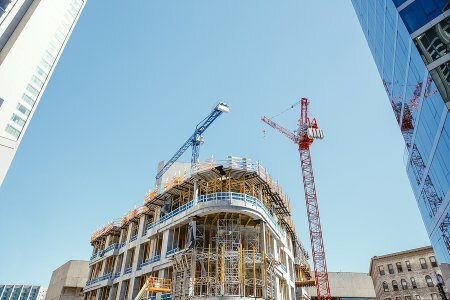 Find out why contractors across the area have been choosing Scaffold Resource for their high-profile projects for decades. Call us today at (301) 924-7223 to talk to one of our professionals about scaffold rentals in Washington, D.C. for your construction job. At Scaffold Resource, we are thrilled to be a top-rated scaffolding rental company in the Washington, D.C. area. If you are gearing up for a project that requires the use of a scaffold or shoring system, you can trust our experts to provide you with top quality services. With more than 20 years of experience, we are a leading authority in the local scaffolding industry. We offer terrific pricing, guaranteed services, and a safety track record that is consistently excellent. When you hire us to help you with your scaffold system, you can rest assured that you will receive guaranteed results. To learn more about why our customers rely on Scaffold Resource for scaffold rental in Washington, D.C., give us a call at (301) 924-7223. With our help, you will be able to set up a safe and secure scaffold system that will support your workers. Our team is looking forward to helping you create the right scaffold solution for your worksite. With a few basic safety procedures, you will be able to ensure the safety of your scaffolding rental. In this video from Augmented Reality in Education, you will learn some essential safety tips for working with scaffolding. To ensure the safety of your scaffolding, you will need to make sure that it has a solid and secure base. If you want to make certain that your scaffolding rental is safe for your workers, contact the team at Scaffold Resource. Using our expert scaffold resources in Washington, D.C., we can design a durable scaffold that is ready for use on your site. Give us a call at (301) 924-7223 to learn more about the benefits of working with our top rated scaffolding company. A rolling tower can be a useful addition to your scaffolding rental. When you include a rolling tower in your scaffold system, you will be able to move your work bay to different locations throughout your job site. Due to the mobile nature of this type of scaffold , it is important to do due diligence for inspection and maintenance. Let’s learn about how to inspect and maintain a rolling tower on your job site. Before a rolling tower is put into use, the entire work site must be thoroughly inspected. A rolling tower requires a flat, stable surface to support its rolling castors. Along with checking the work site for adequate support surfaces, it is important to inspect for any signs of hazardous debris, construction waste, and other materials that could make the rolling tower unsafe for use. At the beginning of each shift, every worker that will be mounting the rolling tower must perform a thorough inspection procedure. The inspection can include a careful check of the castors, joints, and platforms. Workers will also need to make sure that the rolling tower is completely locked into position before they begin their work for the day. A rolling tower must be maintained each day in order to preserve its safety and performance. Some essential aspects of rolling tower maintenance include checking the platforms for damage, inspecting the moving parts for proper lubrication, and making sure that the guardrails are structurally sound. An inspection checklist can be used to ensure that the inspection process is completed correctly. If you are in need of a rolling tower for your upcoming project, contact Scaffold Resource by calling (301) 924-7223. We can provide you with a durable work platform serving Washington, D.C., and our scaffolding rental experts will be happy to tell you more about all of our scaffold solutions. We are looking forward to helping you ensure the safety and productivity of your next job. A scaffold or shoring system is a sophisticated piece of equipment that must be erected and maintained in accordance with the highest safety standards. To keep workers safe on the job, OSHA has created a series of safety requirements that pertain to all commercial scaffold systems. To help you ensure that your scaffold has been set up properly, here are the answers to some of the most commonly asked questions about scaffold requirements. What Is the Minimum Load Capacity for a Scaffold System? 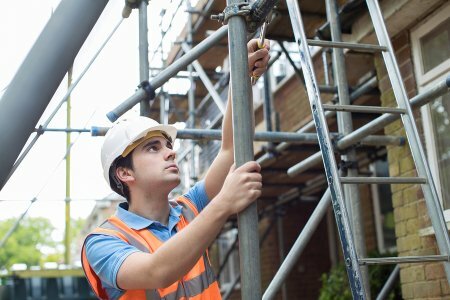 To avoid falls and other unfortunate accidents, a scaffold must be able to support the weight of workers and their tools, materials, and equipment. According to OSHA scaffold requirements, all scaffolds must be able to support their total weight, plus a weight that is four times heavier than the intended load. A heavy maximum weight requirement ensures that scaffolds are fully supported. What Are Some Approved Scaffold Planking Materials? Scaffold planking is the material that a worker will use to walk across and navigate the various levels of the scaffold. When you erect a new scaffold system, you can use planking that has been constructed from wood or fabricated products. What Is the Minimum Work Area Width for a Scaffold? If the work area of a scaffold is too narrow, workers may not have enough space to perform their jobs safely and correctly. To follow OSHA regulations, you will need to make sure that your scaffold work area is at least 18 inches in width. Narrower work areas are permitted, but they must be supplemented with additional safety features. If you have more questions about scaffolding rental serving Washington, D.C., contact Scaffold Resource . Our highly experienced company specializes in construction scaffolding, and we can help you to ensure that your scaffold system meets OSHA safety standards. To hire us for your next construction or renovation project, give us a call at (301) 924-7223 and we will be happy to provide you with a quote for your scaffold rental.